A senior Labour figure has said the home secretary should make a statement to the House of Commons about claims of phone hacking by the News of the World. Leadership hopeful Ed Balls said David Cameron should ask Theresa May to assure MPs that the allegations would be properly investigated. He said government "integrity" was at issue because the paper's former editor was now No 10's head of communications. 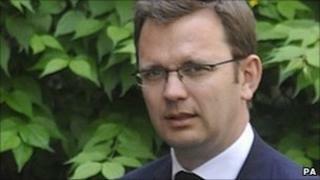 Andy Coulson denies he was aware of phone hacking while serving as editor. Shadow education secretary Mr Balls is the latest in a series of Labour politicians to call for fresh inquiries into the claims, and to question Mr Coulson's suitability for his current position. Among them are ex-minister Tessa Jowell, who says her phone was hacked 28 times, and former deputy prime minister Lord Prescott, who has threatened to go to court to find out whether he was targeted. A senior government source has told the BBC that Mr Coulson was "going nowhere". The News of the World's royal editor, Clive Goodman, was jailed for conspiracy to access phone messages in 2007, but the paper insists it was an isolated case. Mr Coulson resigned over the incident, but told a Commons committee which looked into the allegations last year that he never "used or condoned" phone tapping and was deceived by Goodman. In 2009, the Metropolitan Police chose not to launch an investigation into claims in the Guardian newspaper that News of the World journalists were involved in widespread phone hacking of several thousand celebrities, sports stars and politicians. They said no new evidence had emerged since the original inquiry which saw Goodman jailed. But Mr Balls told the BBC on Saturday: "This goes to the heart of the integrity of our democracy and I think we should have an urgent parliamentary statement from the home secretary on Monday. Image caption Ed Balls said the allegations had implications for "the integrity of our democracy"
"We should look again at whether there should be a new inquiry by the police into what happened. Mr Balls rejected Tory claims that Labour was exploiting the issue for political gain, insisting there would be "questions over David Cameron's judgement if he doesn't see the seriousness of this now". Fellow Labour leadership candidate Ed Miliband also called on the government to take action. "The very least we can have from Downing Street is a specific response to these allegations, to the specific details of these allegations. "I think that until that happens, a cloud will hang over both Andy Coulson and indeed the government, because this is the man in charge of the Downing Street media machine." Mr Coulson has come under pressure following renewed allegations that he was aware of phone hacking by his staff when he was editor of the News of the World. Calls for further action by Labour politicians were prompted by a story in the New York Times this week about the extent of phone hacking which went on at the News of The World. Former News of the World employee Sean Hoare, one of the sources for the New York Times' allegations, told the BBC that phone tapping was "endemic" within the industry and he had been personally "requested" to do it by his then editor, Mr Coulson. But BBC political correspondent Gary O'Donoghue said No 10 "totally and utterly rejected the idea that he allowed anyone [or] asked anyone to hack into any phones". The News of the World said the New York Times story "contained no new evidence". "It relies on unsubstantiated allegations from unnamed sources or claims from disgruntled former employees that should be treated with extreme scepticism given the reasons for departures from this newspaper," it said in a statement. "We reject absolutely any suggestion there was widespread culture of wrongdoing at the News of the World."